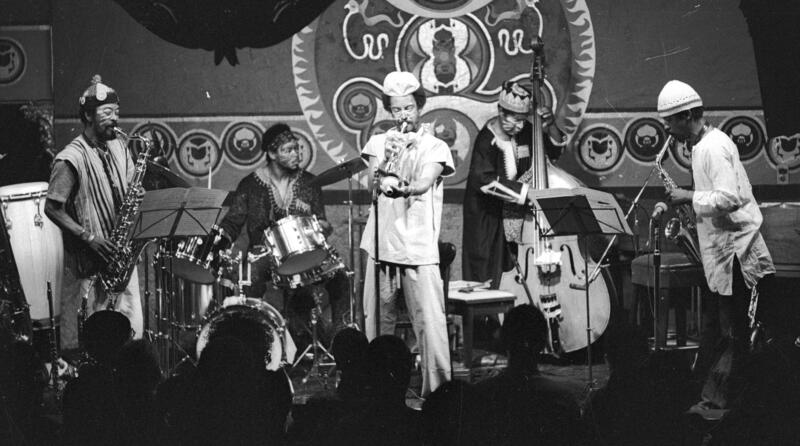 In the mid-1960s, Art Ensemble of Chicago sprung from the Association for the Advancement of Creative Musicians (AACM). Ever since, they have been celebrated as one of the most remarkable free jazz movements to arise from Chicago’s already rich jazz heritage. Moving far beyond jazz, avant-garde and performance art, the ensemble has created a realm that is entirely original. On the opening night of Le Guess Who? 2018, and on the eve of the Art Ensemble’s 50th Anniversary, we celebrate their legacy and welcome them back in style, after a 25-year absence in The Netherlands. Their performance at the festival is curated by Moor Mother. In this article, we trace the roots of the group and its individual performers, their voyages across the world, and their establishment of some truly inspiring cooperative ethics. In “The Capital of Black America”, as Chicago was known in the 1950’s, there were two specific elements that marked the history of three young men growing up at that time. Malachi Favors, Joseph Jarman and Roscoe Mitchell all served in the army, and all three were highly influenced by their musical upbringing, mostly based around life in church, with family members being part of gospel choirs. But it would not be for years that the paths of these three men would cross, to eventually play an unparalleled role in the evolution of jazz and free improvisation. Joseph Jarman’s mother was a gospel singer in church, but it was his uncle who got Jarman into jazz, introducing him to the records of Lester Young and Charlie Parker. The first instrument he would pick up himself – even though he had his eyes set on the alto sax or trumpet – was the snare drum, with his teacher Captain Walter Dyett “applying military rigor” to his teachings. Jarman was in good hands though: earlier on, Dyett had already coached Nat “King” Cole, amongst many others. Malachi Favors had his sights set on the double bass, but that wasn’t his first musical endeavor, having formed a doo-wop group in the 40s. The band disbanded because they couldn’t find a singer of their liking: even the great Sam Cooke didn’t make the cut when he auditioned. Favors started practicing and honing his skills on the bass with great passion. But, when enrolling in the army in 1951, the cello seemed like an easier size instrument to carry around. Tuning it like a bass, this was how Jarman created his distinctive and virtuoso bass sound. It was this experience that started feeding Mitchell’s hunger for musical experimentation, and it would be this sense of musical adventure that would eventually bring Jarman, Favors and Mitchell together in the new decade. In 1961, Jarman, Favors and Mitchell would finally meet at the Woodrow Wilson College. All three had developed a fascination for jazz, and after Mitchell’s experiences with Albert Ayler, their collective listening to Ornette Coleman, John Coltrane and Eric Dolphy further opened their minds about musical possibilities. Jarman and Mitchell’s love for experimentation would be further cultivated by their mentor Richard Abrams, who led a workshop ensemble named the Experimental Band. It’s also Abrams who in 1965, together with Philip Cohran – at that time involved in the Sun Ra Arkestra –, would go on to establish the Association for the Advancement of Creative Musicians, or AACM. The AACM found an important role in supporting and cultivating African-American performers in creating their own music and developing artistic freedom. Another big part of the AACM’s mission was supporting the local community, for example with members providing free music lessons to local kids. In striving for independency, the AACM decided not to raise institutional funds, but to set up a self-financing model with money brought in via membership contributions and concert ticket sales. This collective spirit would play a major role in the future endeavors of Mitchell, Favors and Jarman. Just a year after its formation, a crucial new member was introduced to the AACM: trumpeter Lester Bowie, who exclaimed: “I had never seen so many weird motherfuckers in my life.” Soon after, he would join Mitchell and Favors in what was then called the Roscoe Mitchell Art Ensemble, strengthening their bond over the next years and gaining live experience from local performances. In the late 60s, the Art Ensemble already had come a long way. Because of their devoted spirits – now also joined by Jarman – the group was considered one of the most promising acts AACM had spawned. The group’s sound had developed immensely as well, incorporating theatrical elements and an expanded array of instruments, with “little instruments” like bells and whistles. After roaming the city of Paris, playing shows, and staying in several different hotels, the Chicagoans settled in a country house in the small town of Saint-Leu-la-Forêt, just outside Paris. Surrounded by cherry and apple trees, it’s here that the collective was able to spend entire days writing and rehearsing, the house being fairly isolated. It’s also here that the group’s new financial construct is put into place: the players would not receive individual fees out of shows and recording sessions, but all income went into their ‘cooperative economics’ model, meaning everyone earned and consumed as a collective, and all expenses – food as well as equipment – were covered this way. Furthermore, it’s also in Saint-Leu-la-Forêt that the group took on their definitive name, proudly displaying their origins: Art Ensemble of Chicago. Their new surroundings seemingly caused a creative upsurge, and the group recorded a stunning seven albums that year alone, including staple records like ‘A Jackson In Your House’, ‘Message To Our Folks’, and ‘People In Sorrow’. These records display the rich and diverse sound the group had developed, featuring theatrical elements, elements of poetry and spoken word, and “little instruments” and percussive sounds like woodblocks and bells, but also bicycle horns. 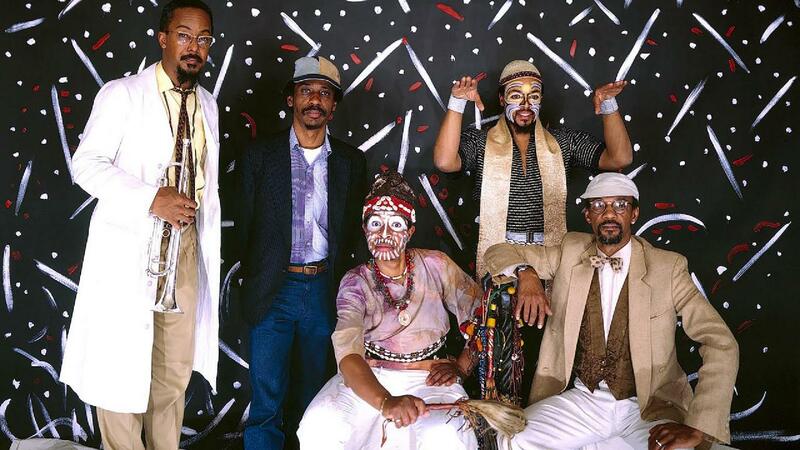 The richness of the Art Ensemble’s sound, their prolific output and the well-received live performances soon established the group’s name throughout France, further aided by an extensive collaboration with Brigitte Fontaine that year. 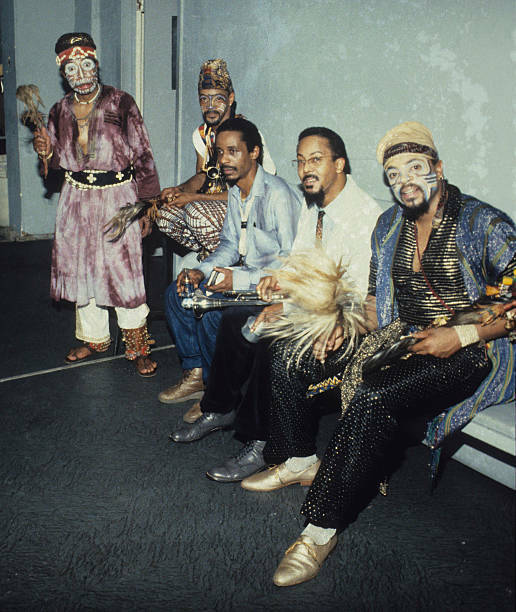 Before the turn of the decade, there would be one more important happening for the Art Ensemble: having spent years without a drummer, the group attracted a new member in the form of Don Moye, who had come to Europe a year earlier with a group called Detroit Free Jazz. After having recorded a stunning 15 records during their time in Europe, the Art Ensemble returned to the States in 1971. While being welcomed as heroes, the opportunities to perform in their home country still proved scarce; one of the very reason why the members moved to France two years earlier. Instead, during the upcoming years in America, the band would focus more on side and solo project as well as other ventures. This did not only provide additional income, but also spawned new inspiration and creative ideas. These cooperative practices were again a continuation of the principles of the AACM, and Art Ensemble was swift becoming the lead practitioner of the AACM vision. Art Ensemble’s biggest performance in America, until then, would come in September 1972. At the Ann Arbor Blues & Jazz Festival, the group shared the stage with none other than Muddy Waters, with a crowd of ten thousand in front of them. One of those ten thousand was Michael Cuscuna of Atlantic Records – the label who had also signed Led Zeppelin and Crosby, Stills & Nash earlier, as well as jazz greats like Charles Mingus and John Coltrane. Cuscuna immediately saw a place for the Art Ensemble between these acts, and to show how impressed he was with the band’s performance, the first release for Atlantic would become 'Bap-tizum': a live recording of that very same show. Now with the power of a major record label behind them, things started moving a lot easier and quicker. The band would receive various invitations to perform. The band started preparing for serious tours, not just in the US, but also several times all throughout Europe and even in Japan. After recording their second album for Atlantic in 1972, ‘Fanfare for the Warriors’, the band found it time to take matters in their own hands, and would start their own label in 1975: AECO Records. In 1977, the Art Ensemble signed to the prestigious ECM, after the label’s founder and producer had already been fans of the group for several years. Two years later, the group’s first album for the label was released, entitled ‘Nice Guys’. ECM was already gaining acclaim as being a genre-breaking label at that time, but with the signing of Art Ensemble, their status moved fast-forward and ECM quickly became known as a highly innovative frontrunner in the music industry. Pair this with ECM’s extensive distribution network, and ‘Nice Guys’ and follow-up album ‘Full Force’ became Art Ensemble’s most commercially successful albums. The label also supported the group in other ways they hadn’t experienced before. ECM saw live performance as the best promotional activities to boost album sales, meaning the label would organize and fund entire tours. Indeed, the “ECM Years” would become Art Ensemble most successful period and it saw the band performing around the entire world, covering ground in previously unexplored countries like Mexico, Brazil, Russia, and Australia, besides extensive tours in Europe and the return of the band to Japan in 1984. Ironically, during this same period, a strong traditionalist movement was rising through the jazz world during the same years as the Art Ensemble’s career height. Shunning any form of traditionalism themselves, it meant the group’s slogan became more widely used than ever: Great Black Music, Ancient To The Future. The latter part of the slogan was meant as a limitless, forward-thinking credo, while ‘Great Black Music’ was meant not only as a description for their own work, but also as an honoring of their cultural ancestors and as a Pan-African concept. Following ‘The ECM Years’, the Art Ensemble would release their next work through the Tokyo-based DIW and New York’s Pi Records. While these labels didn’t have the same presence as ECM, this period did see the Art Ensemble achieve more artistic highs with a new live album recorded in Japan and the release of essential records like ‘The Meeting’ and ‘Sirius Calling’ (2003 & 2004). 2003 also marked the brief return of the group on ECM for ‘Tribute To Lester’. Indeed, the later years of Art Ensemble of Chicago also marked some inevitable lows. In 1998, Lester Bowie was diagnosed with liver cancer. He kept performing as long as he could, up to his passing on 8 November, 1999. In 2014, the same fate fell to Malachi Favors who passed away very sudden on 30 January after late-stage pancreatic cancer was discovered just earlier that month. Joseph Jarman had already left the group earlier on, to focus on a new mission as a Buddhist priest. Such tragedies did of course put the Art Ensemble of Chicago to the test. And it’s true that from the 1990s on, output and live shows became more infrequent. But as always, the group kept their eye on the future; such forward thinking spirit had been built over four decades and over 50 albums. And in some sense, their history had built their future. Thanks to investing in their local community (amongst others with the cooperative ideas that were put into place with the AACM), it meant that new musical talent had always been supported, and a new generation of performers had been developed. Art Ensemble of Chicago’s line-up at Le Guess Who? 2018 will consist of Roscoe Mitchell and Famoudou Don Moye next to trumpeter Hugh Ragin, who studied at the Creative Music Studio with Roscoe Mitchell in the late 70s; bassist Jaribu Shahid, who joined the Art Ensemble in 2004 after being a part of the Creative Arts Collective and working with a.o. Muhal Richard Abrams, Anthony Braxton, and Roscoe Mitchell; Chicago cellist Tomeka Reid, recently described as a “New Jazz Power Source” by the New York Times, and having been a key member of ensembles led by Anthony Braxton, Roscoe Mitchell, and Nicole Mitchell, as well as various AACM-related groups; and Dudu Kouate, Senegalese percussion player, multi-instrumentist and singer, guardian and conserver of the musical and cultural traditions of his West African roots, who plays an infinity of little instruments and can even create a marvellous sound from pumpinks. 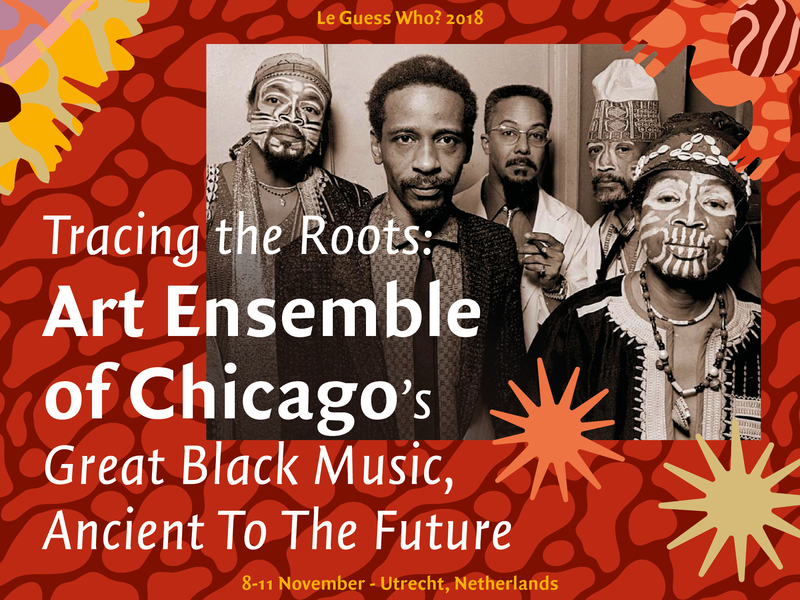 Art Ensemble of Chicago will perform at Le Guess Who? 2018 together with a.o. Neneh Cherry, Swamp Dogg, Nicole MItchell, Colin Stetson, Anoushka Shankar, Irreversible Entanglements feat. Pat Thomas, Lonnie Holley feat. Nelson Patton, Hailu Mergia, Jerusalem In My Heart, Kadri Gopalnath, Sons of Kemet XL, and many more. This feature wouldn't have existed without the great work of Paul Steinbeck and his book on Art Ensemble of Chicago, "Message To Our Folks". If you want to dive deeper into the group's legacy, we urge you to pick up a copy; a paperback edition has just been published and is available via Amazon or the University of Chicago Press.